Just a few notes on Interstellar. The movie is 169 minutes long. There is a nice pacing to the film. Some parts, especially the whole sequence with Matt Damon feel as if they could have been shortened. Nolan tells an epic story with very few characters (McConaughey, Hathaway, Chastain). In a current TV golden age of Battlestar Galactica or The Wire with complex multi character narratives, fictive worlds in feature films can feel reductive. Films have this distinct structure to deliver the story within a 2 or 3 hour frame. Luckily, the three main characters are well fleshed out. Nolan is an old school type of filmmaker who likes to shoot on film. He believes in the 2-3 hour single movie. Interstellar evokes the ghosts of Kubrick and Tarkovsky. The cinematography and image quality are excellent, as are the space scenes. They feel more authentic and satisfying than much of recent CGI. Christopher Nolan is a master of the pastiche. Inception had a variety of sourced imagery that it successfully integrated into a compelling ‘new’ narrative. Interstellar is less inventive and it can feel like a relatively straight forward mash-up of image elements sourced from Looper (the Kansas setting and time travel logic) and 2001: A Space Odissey (the weird trip near the end, the comeback). The drone at the beginning of Interstellar reminds me of the crop duster in Looper, even if it has politically higher connotations in Interstellar (the world is truly ending if even surveillance fails). Looper also plays with the urban/rural dichotomy. The cities are futuristic and gritty, the countryside setting nostalgically loaded with childhood and other deep seated memories (the patriotic, highly constructed idea of ‘land’). In both Looper and Interstellar, the land setting feels somewhat fake. The children of McConaughey’s character Cooper could perfectly fit, but as a family, the house feels overly austere. It’s not very believable that the whole gadget and consumer market for technological devices ceased to exist. This is a Richard Sennet type manual craft and book world again. This world needs farmers – or scientists. The whole middle in between seems to have vanished. Besides Looper, there is a bit of The Road (people’s search for food or a better place; on the road again), moments of Inception itself (the doubling of the whitish alien landscape, mirror-effect like; the stunning fourth or fifth dimension maze Cooper enters). The hidden maze of crop fields are not explored as in Signs, but there you also have a family tested by another, interstellar force (badly designed aliens in Shyamalan’s case). Then there is of course Matt Damon who gets back into his proven, more sinister character type as seen in Talented Mr. Ripley or The Departed. The final space station looks like the one in Elysium, in which you also find a tense, overpopulated, sand-infested atmosphere. As mentioned before The Mirror by Tarkovsky, maybe Solaris and even Stalker (the psychological effects, the psychology of space). Kip Thorne’s theoretical work on wormholes inspired the film, he acted as both scientific consultant and executive producer. A special mention goes to Gravity of course who seems to have inspired much of the partial destruction of the space station inflicted by Matt Demon’s character gone irrational. Christopher Nolan proves himself again not necessarily as a master storyteller, but as a master of memory, of bringing images from different sources together into a almost perfectly fitting 3 hour image-narration construct. In a referential, image-hierarchical sense, Nolan really knows his craft. He manages – and that might be his ultimate strength – to isolate strong viusal patterns of recent and older science fiction films and, together with his brother and wife, to bind these images together into new narratives that pay tribute to the ones he borrowed from. Nolan thus helps us to remember and recollect other films, to navigate in a sometimes confusing image world, to bring a certain simplicity to complexity. In this sense he is a curator of images that matter to him. Elements from Kubrick’s 2001, from Gravity, Looper, Elysium and Inception are neatly integrated, evoked, remembered within Interstellar. Emotion matters to Nolan, of course, but emotionally Gravity was probably more intense than Interstellar. The potentially rich love interest between astronauts Cooper and Brand is not explored. Instead everything is put into Cooper’s relation to his child Murphy, the emotional key link of the film. Yet Nolan’s main interest does not lie in the portrayal of love or hate (In Inception, the relationship between Cobb and Mal was only superficially explored), nor the subtle shades between love and hate. In a sense, Nolan’s ultimate interest is more clinical, structural, image based. Nolan shines when flashes of visual compositions appear dream-like, as wonders coming from another sphere. For example the bundle of characters in Inception. The strange, alien looking Tars machine aid in Interstellar. The dimension chamber in Interstellar. The map on the body in Memento. The burning fire brigade truck in The Dark Knight. These moments are visually visceral; the storytelling is suspended for brief moments, making way to an immersion in the visual itself, in the memory maze that is cinema, that is creation, imagination. Cinema is the suspension of disbelief and Nolan borrows, develops and designs narratives and images that structurally contain core elements of what makes the suspension. In Nolan’s strongest moments, laws of logic and gravity are metaphorically and literally suspended. We witness these moments, we ‘see cinema’. What we wish to encounter in cinema is suddenly strangely materialised in front of us. Nolan probably perceives reference systems similar to a scene in Interstellar. At the end of the film, Cooper resurrects Tars and programs the humour setting. He begins with 75%, Tars makes a joke (along the line ‘autodestruct in 10, 9, 8…’), Cooper goes ‘can you go to 60%’, Tars makes another joke, Cooper: ‘can you make that 55?’ Nolan has an affinity and gift to integrate other images into his work, transforming images and make them his own under new form. To him, image are beings with different intensities. When he chooses to work with scenes and images from other films, how does he proceed? How do the images end up in his film, how are they changed? Nolan is a choreographer of image intensities, like a conductor he orchestrates image flows of our time. He sets these image into entities called film, in a tradition and lineage of great filmmakers as Kubrick and Tarkovsky. I’m wondering what narrative he will explore next. Or more precisely, how he will bind and weave existing imagery into the narrative. Watching Nolan films also contain the message of what other films should be recalled. In this sense they contain a referential sharing element. How will the references be balanced, applied, intermixed? These structural, but sensitive navigational image-layers and decisions interest me in Nolan’s work, probably more than the films or stories themselves. This entry was posted in CHRISTOPHER NOLAN, FILM REVIEW, INTERSTELLAR on November 8, 2014 by mathisgasser. Humans are no longer spectators who need to adapt to their natural environment. Our impact on the earth has caused changes that are outside the range of natural variability and are equivalent to such major geological disruptions as ice ages. Some scientists argue that we have entered a new epoch in planetary history: the Anthropocene. In such an era of planet-wide transformation, we need a new model for planet-wide environmental politics. In this book, Frank Biermann proposes “earth system” governance as just such a new paradigm. Biermann offers both analytical and normative perspectives. 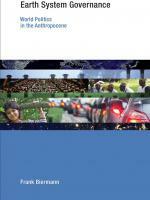 He provides detailed analysis of global environmental politics in terms of five dimensions of effective governance: agency, particularly agency beyond that of state actors; architecture of governance, from local to global levels; accountability and legitimacy; equitable allocation of resources; and adaptiveness of governance systems. Biermann goes on to offer a wide range of policy proposals for future environmental governance and a revitalized United Nations, including the establishment of a World Environment Organization and a UN Sustainable Development Council, new mechanisms for strengthened representation of civil society and scientists in global decision making, innovative systems of qualified majority voting in multilateral negotiations, and novel institutions to protect those impacted by global change. Drawing on ten years of research, Biermann formulates earth system governance as an empirical reality and a political necessity. This entry was posted in ALEXANDER KLUGE, ANTHROPOCENE, ARTISTS, BOOK REVIEW, FRANK BIERMANN – EARTH SYSTEM GOVERNANCE on November 2, 2014 by mathisgasser.